Someone asked me recently what I think about war. So let me share a story first, one that was shared with me last week. An old and dear friend recently returned from a trip to Africa, and we sat, and we talked over some Dogfishhead 90 Minute Ales. He's a doctor, who juggles time between a practice that pays the bills and volunteering days of his time a week at free clinics in Southeast and in the DC jail system. Sudan is at war. Forces from the Sudan are pressing into the South Sudan, trying to clear out that region, with the stated intent of driving Christians and animists from their land so that Sudan can be fully Islamic. And by "Islamic," I mean, "under the control of Bashir." When my friend was there, there were two doctors, for a while. But it was more than he could bear. There were overflights, regularly, by Sudanese Antonovs, and the Sukhoi fighters that Putin has so graciously provided to Bashir's regime. Midway through procedures, the staff would have to flee to foxholes, as taking out the one hospital providing hope to the region might prove so demoralizing that folks would finally abandon hope. He'd lie in that foxhole, and think about being a Daddy to his daughters back home, and wonder, why the hell am I here? And then there was the day he was midway through a biopsy for a local man whose tumors had grown into a vast flesh collar around his neck...and then suddenly trucks roared into the hospital, filled with the dead and dying. A barrel bomb had been dropped from a Sudanese Antonov right smack into the middle of a marketplace. There were scores of the critically injured. There were two doctors. Both were general practitioners. But they operated. And watched teenage boys die, the life heaving out of them. And tried to remove shrapnel from what was left of the faces of pregnant women. There were many, many amputations. Blood was everywhere. There were hours and hours of frantic surgeries, not in an army hospital with logistical support, but in the dust and dirt of a hospital with barely more supplies than your local MinuteClinic. Kids. Women. Fruit merchants. Dead or forever shattered. My friend took a long drink from his beer. "I don't care what they say it is. War? War? It's nothing but murder. No different. There is no difference." And therein lies the challenge, I think, for Christians that wish to take up the sword. We may equivocate, and find elegant ways to justify the territorial squabblings of nations, as if they are somehow more cosmically significant than two neighbors punching it out over where the fence runs between their properties. But the reality of shattered bodies and dying breaths, the ruined potential of a life, that is the great and noble reality of war. That is the reality known by our Creator. The shining romantic fantasies of nationalism are, in the face of the reality of war, just a form of insanity. What do I think of what it looks like for a Christian to go to war? For that, I turn to another story. This one is from the Bible, a story of my namesake. It is the story of a great victory, as the forces loyal to King David routed the insurrection of his son Absalom. David loved Absalom dearly, and wanted only that they be father and son again. Although David had given direct orders that Absalom not be slain, his realpolitik-enforcer/thug/general Joab would have none of it. Joab knew what war was, and when Absalom was found, Joab himself insured he was killed. David, on hearing of the death of the recalcitrant child who he loved with all of his heart, was shattered. 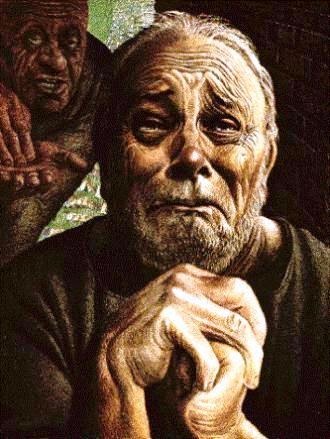 He wept, overwhelmed with the loss of his beloved son. Joab, of course, would have none of it. It ruined the celebration, and demoralized the troops. He forced David to stop his embarrassing and counterproductive mourning at the loss of a child with whom he hoped to reconcile. "You show you love the ones who hate you," spat Joab, as he threatened to abandon David. "That means you hate the ones who love you." Then Joab bullied him into sitting before the troops as they marched by in triumph. Joab is the spirit and truth of war. But David? Joab said it best. "You show you love the ones who hate you." David's reaction gets us to the truth of what it means for a Christian to take up the sword. The one you are bombing or sniping is God's child, more deeply loved by God than Absalom was loved by David. Maybe they are broken. Maybe they are wrong, or in the service of a tyrant. But that does not change the reality of God's love for them. If you are a Christian, you must believe this. If you do not, then you should set aside the illusion that Christ is your Lord. Can a Christian go to war? Of course. But to be authentically Christian, you must love the one you take up the sword against, as if they are your own baby. Your own daughter. Your own son. And that is hard and terrible. Because war is real, and that reality is a hard and terrible thing.